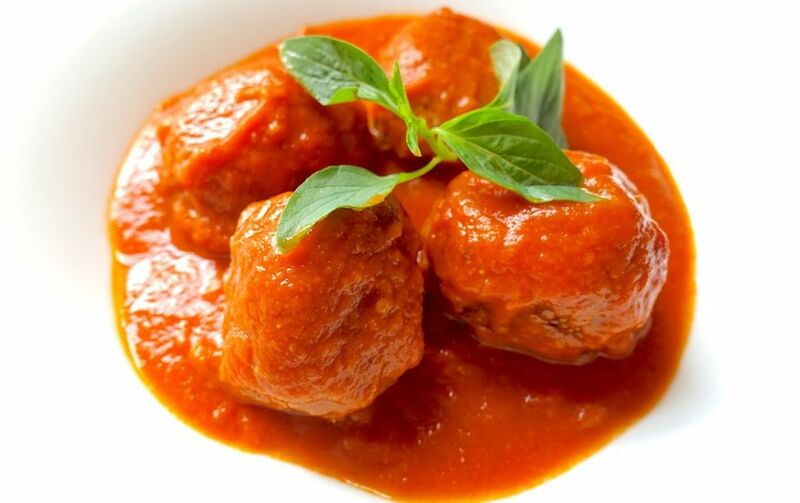 This is not your typical meatballs in tomato sauce recipe, this one comes with a twist! Thai basil adds an anise-like and slightly spicy fragrance to the meatballs, flaxseed replaces breadcrumbs and is packed with omega-3, fatty acids and fibre, and chopped onions already sautéed give a bit of sweetness and soft texture to the meatballs. The tomato sauce is packed with flavour and colour. It has chilli, tarragon, balsamic vinegar, turmeric, cumin, strawberries, and the final outcome is delicious. Peel onion, finely chop, and sauté in olive oil at medium heat in a large pan until translucent. Add finely chopped garlic, mix well, cook for one more minute and remove from heat. Rinse Thai basil leaves, pile them up, roll them together and finely slice. 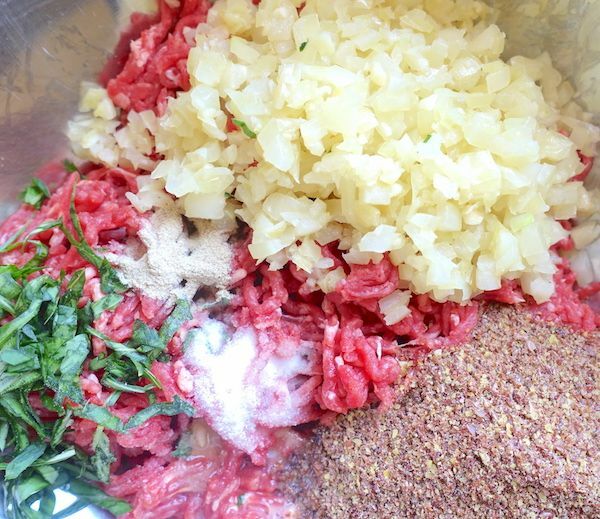 In a large bowl mix minced meat, sautéed onion and garlic, salt, pepper, flaxseed and sliced Thai basil. Add lightly beaten egg and mix thoroughly all ingredients with clean hands. Grab a little bit of the mix and cook it in the pan to test the seasoning. Adjust seasoning in the uncooked mixture if necessary. With damp hands, make 16 meatballs with the mixture. Do your best to make them homogeneous in size so they cook evenly. Place meatballs in a tray or plate, cover with plastic film and chill in the fridge for at least half an hour. Peel garlic cloves, cut in half lengthwise and remove germ. Crush one clove and leave the other cut in half. Reserve. Heat olive oil in a saucepan at medium heat and add garlic clove cut in half. Do not colour the garlic but move the clove around to release its aroma into the oil. Add finely sliced shallot to the saucepan, stir and cook until translucent. Add rinsed and chopped Bird’s eye chilli with seeds included and mix a little bit. Add cut tomatoes, strawberries, cumin, and turmeric to the saucepan. Cook for a few minutes mixing everything. At this point add crushed garlic clove and bay leaves, balsamic vinegar and dried tarragon. Cook in low heat uncovered. When tomatoes are well cooked and very soft, remove bay leaves, whole garlic clove and let cool down for a few minutes. Pour the tomato mix in a food processor and blend well. Filter the sauce in a strainer pushing the pulp with the back of a spoon to get most of the sauce. Heat olive oil in the same large pan where you sautéed the onions and garlic. Cook cold meatballs in olive oil at medium heat for about five minutes. Make sure you move them around to brown them all over. 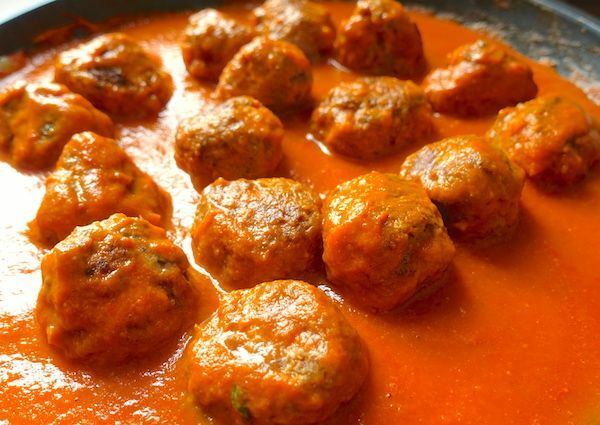 Pour 2 1/2 cups of tomato sauce and simmer for 10-15 minutes, until meatballs are cooked. Serve in a bowl or hollow plate, 3-4 meatballs per person and be generous with the sauce. Thai basil blends very well with the spices and meatballs. It tastes even better with a generous amount of aromatic tomato sauce. Generosity of the sauce in the plate gives a rich and flavourful experience. No ingredient predominates the dish. You can taste the meat, herbs, tomato, spices and even a hint of strawberry in the sauce. The colour is bright orange which looks delicious. If you eat without a garnish, four meatballs are a good serving, otherwise less. The garlic is present in a subtle way and the onions feel soft and taste almost sweet. Although it’s a beef dish, I would pair it with a light rose wine or a crisp sauvignon blanc to freshen up the spices with a bit of acidity. Thick slices of sourdough bread. Enjoy and don’t forget to leave a comment if you have something to share!